Arquitectonica designed the master plan, architecture, and landscape architecture for the most ambitious of all of Arquitectonica’s downtown Miami projects is Brickell City Centre (BCC), a five-million-square-foot complex that spans more than five city blocks and includes three levels of shops, office towers, and a 352-suite hotel. The master plan includes a new transit station for the Eighth Street Metromover and a vast underground parking garage, one that weaves in and around the existing streetscape, and merges with the city itself. This 5 million square foot (464,515m2) development includes 729,000 square feet (68,000m2) of retail and entertainment; nearly 1,000,000 square feet (93,000m2) of office; nearly 1,400 residential units; a 352-key hotel; 89 serviced apartments (operated by the hotel); and two levels of below-grade parking. Phase 1, with 5 million SF, is completing construction, having already opened the EAST hotel, the two office buildings, and the two residential condominium towers. The retail mall opened in November 2016. The development is the largest construction project in the United States. 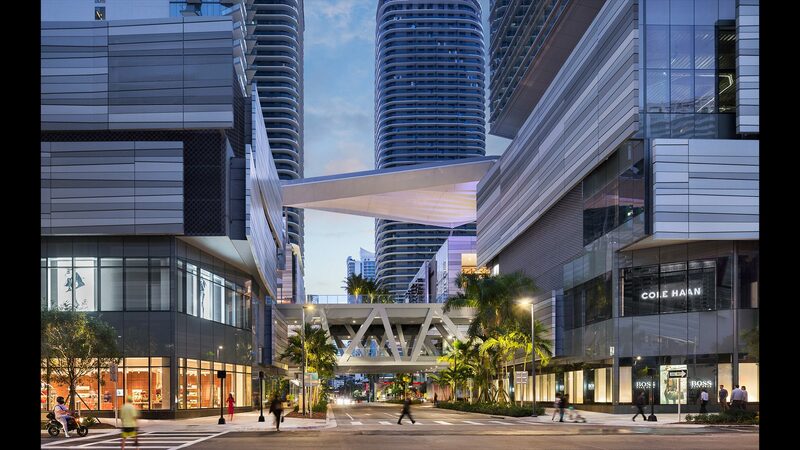 Arquitectonica designed Brickell City Centre to meet both LEED-Neighborhood sustainability standards and LEED-New Construction (NC) and Core & Shell (CS) accreditation for the development’s individual buildings.